· Saturday 5th August 2.00-5.00pm, the charity Mind is hosting a Tea Party in the garden whose entrance is situated between numbers 16 and 17 Rhind Street, in Bodmin (This is the road where the Westberry Hotel is situated). · Monday 7th August, the wildlife haven of Lethytep, which some of us visited in 2017, will be hosting the U3A Photography Group whose members will receives the expert advice from David Chapman, renowned Cornish photographer who specialises in landscapes and wildlife. Any member of the U3A is welcome to attend. The visit starts at 2.00pm.
. Sunday 13th August: YY gardens, Milltown open from 2pm to 5pm in aid of Macmillan Cancer Support. Sunday 23rd July: Trewether Farm Garden will be open from 10.00am until 4.00pm. Work is in progress in many areas. Phil and Judith invite you to walk around their 3 acres of garden, including “The Oriental Garden”, “Trelawney Bay” and “Melody Meadow”. They have 40 beds holding approximately 20,000 plants, including many rare specimens. They also hold one of the largest Conifer collections in the country. There will be teas, a plant sale and an opportunity to visit “Choughs” – a new venture displaying painted furniture, upcycled items and soft furnishing. Trewether Farm is on the Lostwithiel to Lerryn road, one mile from Lostwithiel on the left. You can follow them in Facebook. One of our members, Helene Fletcher, is opening her studio again this year for the Open Studios Cornwall event. Check my details (no 240 in brochure) or on line at www.openstudioscornwall.co.uk. 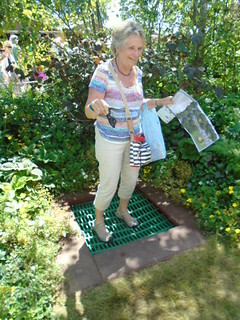 She will be opening her small garden as well on the 2nd,3rd and 4th June from 11am till 5pm. The charity we are supporting this year is the Cornwall Air Ambulance. 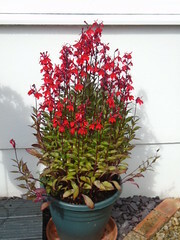 Her address is: 4 Middleway, St Blazey, Par, PL24 2JH, tel: 01726 817 620. Helen looks forward to seeing you. If you have not yet managed to walk though Lanhydrock to see the bluebells, do so as they are absolutely wonderful especially if you walk through the whole estate. I went to Pentillie Castle on Bank Holiday Monday for their garden open day. The weather cleared up and we had a great afternoon. Amazing views of the river Lynher, especially as you walk to the Mausoleum. 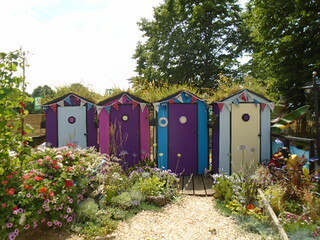 You are also able to go into the bathing hut which is used for civil wedding ceremonies. And of course there were plenty of bluebells. It was my first visit and I wholeheartedly recommend the visit. There will not be any more open days this year but bear this in mind for 2018. BBC Gardeners World have a magazine out now which contains a voucher lasting 1 year allowing 2for1 entry to 400 gardens, or half price for 1 in 165 of them. Mag. costs £4.50 or £4.75. I shall get mine soon as there's bound to some in our area. Fowey Festival week - on Friday 12th and Saturday 13th May, it will be possible to visit 10 private gardens in Fowey. This is purely to see the gardens and no refreshments will be available but there is a good selection of cafes etc. in the town, as you know. If you're interested, you can visit the website where a detailed description of each garden is given and a map of the Secret Garden Trail can be downloaded. When a garden is used as a place to pause for thought, that is when a Zen garden comes to life. When you contemplate a garden like this it will form a lasting impression on your heart." Fourteen members of the group made their way to St Mawgan for our last garden visit of the year and once again we had dry weather for our visit, even if the sun was rather reluctant to make an appearance. Natalie Hore and Stuart Ellison gave us a warm welcome and told us about the history of the garden which they took over from Natalie’s parents. The development of the Japanese Garden first began in 1991; however the location was chosen in 1985, when Robert & Stella Hore moved on to the site. One year later their daughter (Natalie) was born and on 1st May 1988 the Bonsai Nursery was opened to the public. The Japanese Garden took 6 years to create before Robert felt it was ready for people to see. 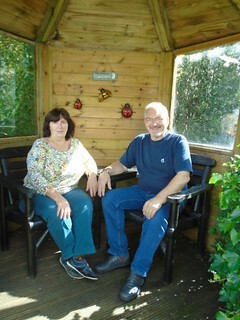 Opening on 1st May 1997, the Japanese Garden has continued to grow since then; Robert and Stella, now retired, have handed over management of the garden to their daughter Natalie and her partner Stuart. Winding paths lead from the entrance past the water garden to other hidden areas, and the element of mystery created reflects the mystery of the universe which we may contemplate whilst walking or sitting in one of the seating areas placed around the garden. This journey is a physical and sensory experience. Our eyes follow the stone paths, our ears hear the sound of our footsteps on the gravel and we feel connected to the earth. Twists and turns in the pathways are employed to make one pause and view an area, tree, rock or ornament from a particular angle and yet, like the water garden which may be viewed and enjoyed from a variety of situations, feel natural rather than contrived. Viewing Points are a significant feature of the Japanese Garden and each of these were planned with meticulous care. The careful placement of plants, trees, rocks and ornaments to attract one’s attention and provoke reflection, or to obscure a view and excite one’s curiosity and desire to see what lies beyond, demonstrate the skill and artistry of the design. Many of the features commonly associated with traditional Japanese gardens are to be found in and around the water garden area, including the shishi-odoshi [deer scarer], stone lanterns, tsukubai [water basin], bonsai and, of course, the waterfalls, ponds, bridges, islands and Teahouse. The bonsai, a Japanese Larch forest planted on a large slate slab, can be glimpsed through an archway formed by the interlaced branches of a pair of blossoming cherries [Mount Fuji] near the exit from the garden. Rocks, plants and water are the unifying elements in Nature and are therefore of paramount importance. Rock reflects strength, stability and endurance. Water reflects the sky and the sound of running water stimulates our awareness of being alive, of being connected to the universe. The owners have planted over 120 named varieties of Acer palmatum, plus others chosen for their forms and coloration. The diversity of plants that they are able to grow in this sheltered valley offers a rich visual experience: perhaps the most stunning of these are the Japanese maples with their graceful forms and spectacular colour changes from spring to autumns end. One of our members, Lin Briggs, is also a member of the Bonsai Society and she gave us a useful insight into this art form. Thanks to her, we learnt about "cloud pruning" when we walked past two Japanese holly trees. We all agreed that we would want to go back to the garden in the spring to see the azaleas and rhododendrons in bloom as well as the cherry blossom. Natalie suggested that we follow her blog to find out when the cherry blossom is out, as the timing varies from year to year. Regular readers of our reports will know that we always indulge in a lunch and/or afternoon tea during our visits. 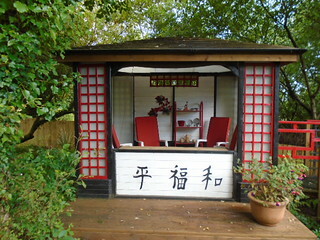 The Japanese Garden does not have a tea room, however all was well as there is one in the village. We had phoned our order through earlier that day and we walked to the shop/post-office/tea room where we were made to feel very welcome. We all had a scrumptious lunch and we highly recommend a visit to this establishment. Their gardens were still in full bloom with amazingly healthy varieties of fuchsias and begonias. 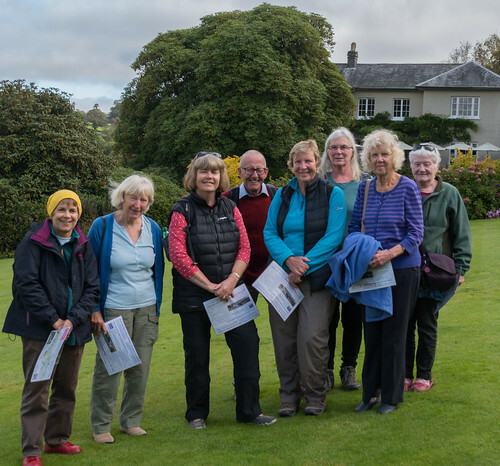 The Garden House at Buckland Monachorum was the destination for September’s garden visit. The sun peeped through as we skirted the edge of Dartmoor and continued to gain strength as the day went on. The garden occupies about 10 acres and has a wide variety of styles from woodland to walled garden. We happily meandered through the paths peppered by remaining colour in the plants, chatting to the gardeners en route. 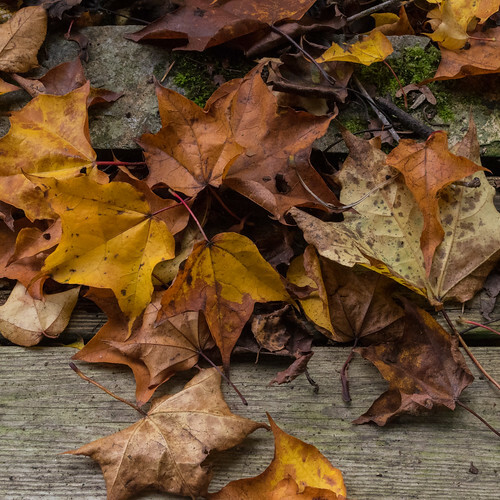 This visit was definitely our first glimpse of Autumn as the leaves had begun to fall and the many varieties of acers were starting to change colour. The walled garden was a delight with many dahlias still blooming well, and a large number of Colchicum which were new to many of us. 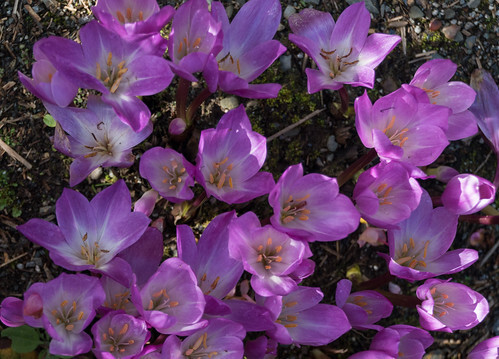 Annie was able to surprise us with a song learnt in her youth about the colchicum in the meadows signalling the end of the summer – how apt! 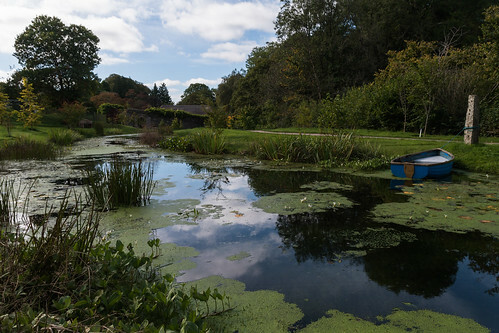 The newest part of the garden is the Arboretum which is maturing well and has some beautiful ponds which were attracting a lot of dragon and damselflies. The Garden House is a delight to wander around and we all vowed to return at different times of the year to see it in different times. Most importantly we enjoyed a delicious lunch and tea before we left! 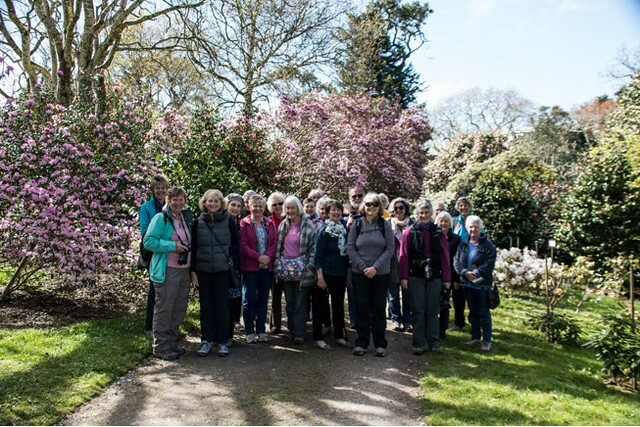 On Tuesday, ten of our members braved the uncertain weather to visit the gardens of Mike and Jayne Truscott in St Austell. The showers gave way to a very pleasant spell of sunshine and we all enjoyed the exploration of the garden with the host and hostess. It is a large garden at the back of a standard semi-detached house and has been developed in stages into a lovely garden full of hidden areas to explore with seating areas all around it. There are several water features and interesting patios with lots of planters containing miniature plants and pots of colourful flowers. At the back of the garden is a large vegetable and fruit area with a Japanese Gazebo, built by Mike, to sit and admire the work that has been done. The latest plans are to plant more acers which will give lovely autumn colour to that part of the garden. 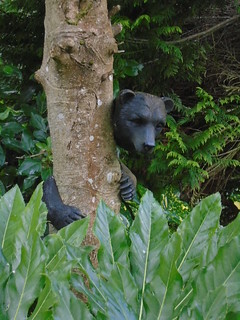 Also a number of sculptures are dotted around including a great fox and badger and I especially like the model bear who is peeping around one of the trees. 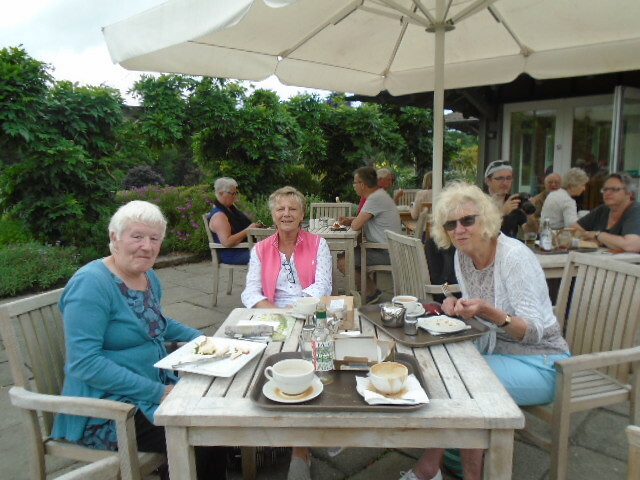 After the tour we enjoyed lovely tea and cakes on their patio and all the income from the visit are being donated to Cornwall Hospice Care. The garden has been open in the Spring each year for the last nine years for the local Hospice and should be open, possibly for the last time, next Spring so keep a check on the “Cornwall Open Gardens for the Hospice” magazine. Our next visit is organised by Lindsay Southgate. We will visit the Garden House in Devon and members will soon receive details. 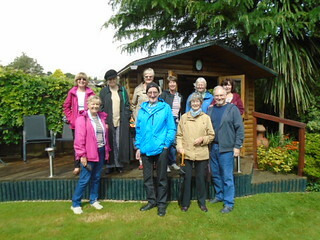 One of our members, Judy Bowen Jones, had decided to open her garden for the first time ever to the U3A Garden Visit Group. Her daughter Emma also opened her garden. Undeterred by the threat of thunderstorms and heavy rain, fourteen members of the group made their way to Pantersbridge, optimistic that the blue sky we could see over Bodmin Moor would last for the duration of our visit. No such luck! We started the afternoon in Judy’s garden trying to take in as much as we could before the downpour. 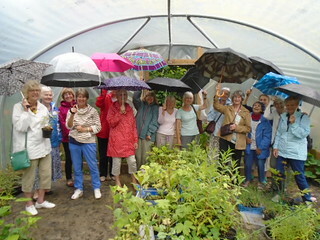 We then all retreated to the poly tunnel which houses the plants for sale and Judy and Bill told us about the work that they had done over the last 8 years. The first thing they had to do is bring light into the garden and they spent one year felling all the Christmas trees and other conifers that formed the border between their garden and next door’s. Judy’s proudest part of the garden is the hot bed in the middle of the lawn. Members all liked the great colour combination and contrast in the shrub bed. One of the delights in the garden is the wild riverside walk along the Warleggan River (also known as the River Bedalder) that Judy has created and which leads to a log cabin. There is even a drawbridge to reach the field the other side of the river! We were also impressed by the nectarine tree in Bill’s greenhouse which is bearing many fruit. As the rain was not abating, it was time to have tea and cake. The cakes had been provided by local ladies from the church and they were scrumptious. Every cloud has a silver lining and our silver lining was that the rain lasted long enough for us to have 2 slices of cake! The rain stopped, so it was time to make our way to Emma’s garden. Her property is situated along what used to be the main road to Bodmin. Difficult to imagine! It is now a private lane which belongs to the property. In medieval times, there was a mill at Pantersbridge. I do not think that any of us had ever visited a garden like Emma’s. Her starting point was a cliff behind her house and a wild meadow well above the house. Over the last 4 years, Emma has worked amazingly hard to create thriving flowerbeds and a highly productive vegetable garden. Bill helped, brought the digger and created a shelf in the cliff behind the house to give access the field – this path is covered in bluebells in the spring. There were plenty of herbs and vegetables growing in the poly tunnel including an amazing hardy kale “tree”. The aim of the open day was to raise money for the homeless charity Emmaus. Emmaus supports people who have experienced homelessness by providing them with a home and meaningful work in a community setting. Emmaus started in France shortly after the Second World War, when homelessness was a big issue. The first Emmaus community was founded in Paris in 1949 by Father Henri-Antoine Grouès, better known as Abbé Pierre. He was an MP, Catholic priest and former member of the French Resistance who fought to provide homes for those who lived on the streets of Paris. The first UK Emmaus community opened in 1992 and there are now 29 communities spread across the UK. The Emmaus Cornwall group was set up in 2011, and there are big plans to set up the first Emmaus community in the area. They are therefore fundraising hard to buy land. Judy and Emma thank you all for your generosity as the open day raised £170.50. Our August visit is being organised by Judy Dixon. We will visit May Tree Garden in St Austell and members have been e-mailed/sent the details. Earlier in the year, a small group of members met to consider a list of options. We all agreed that the trip organised by Williams Travel fulfilled all our requirements and in the end, six of us booked a place on the trip. We were picked up at various locations in Cornwall and travelled to Buckfast Abbey for a one-hour comfort break. There was time to visit the abbey or to go round the gardens. We then made our way to Bath for a two and a half hour lunch break. Judy Dixon proved an amazing guide throughout the trip and took us for a walk along the river to the weir. Our hotel for the 2 nights was the Copthorne Hotel Slough-Windsor – not a hotel where to stay in a heat wave due to the lack of air conditioning! Still, it did not detract from our enjoyment of the following two days which more than met our expectations. It would be foolish to try and describe the Hampton Court Flower Show or Kew Gardens, unless you are ready to read a 100 page essay! So instead, we will share with you the parts of our trip that we enjoyed most and we hope that the slideshow at the end of each section of this report will do justice to what we saw and enjoyed. 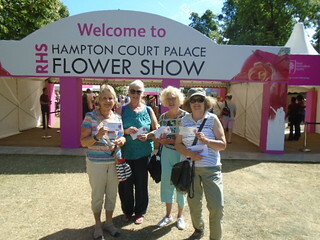 A bonus was to walk through Hampton Court Gardens on our way to and back from the show area. Some of us made our way to the floral marquee before it got too hot and crowded. As you can imagine, the marquee was full of intense colours and aromas. You could spend at least half a day there and our favourite stands included: the clematis, the lavenders, the orchids, the grasses (which included glass fishes which appeared to swim amongst the grasses) and the alliums – we had never seen so many varieties of allium! Oh, I almost forgot to mention the Ememurus stand! This was a plant new to me and I loved their plume-like stems! Before going into the beautifully scented rose tent, we tried to view as many gardens as we could but we did not see them all as we needed to have a rest from time to time in the shade: the temperature was over 30 degrees! So which were our favourite gardens? The Zoflora and Caudwell Children’s Wild Garden: the garden highlighted the beneficial qualities of a sensory garden for children with various disabilities, in particular autism. We were able to walk through the garden, talk to the creators and experience first-hand some of its features (can you spot Judy Dixon having a go at the in-ground trampoline?). We were not surprised to hear that that garden had won joint First place in the "People's Choice" vote. 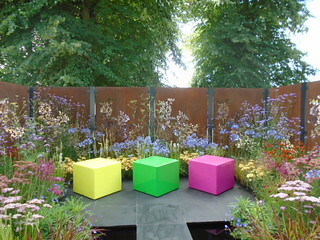 Colour Box: a celebration of people helping people within the horticultural community. It was full of colours - nothing muted there! The two Southend-on-Sea gardens also caught my eye - these gardens were built by young offenders who are looking to build a brighter future and used the project to learn new skills and further their knowledge. Two of us took the opportunity to seek advice from the experts: Doris needs to repot her bougainvillea and put it outside whilst I need to ensure that in the future, I pot my achillea plants into 30% soil and 70% grit. 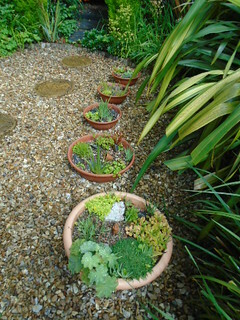 The pots need to be stored in a dry place to survive the winter. Watch this space! 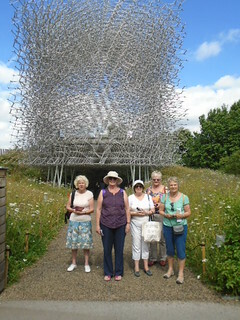 We were all impressed by The Hive and its serenity – a huge contrast with the previous day which had been so hectic. Rising to 17 metres, The Hive is a feat of British engineering. Commissioned by the UK Government and created by artist Wolfgang Buttress, Simmonds Studio and BDP, this multi-sensory installation formed the centrepiece of the UK pavilion at the 2015 Milan Expo. The Hive is an immersive sound and visual experience. The lights you see and the sounds you hear inside The Hive are triggered by bee activity in a real bee hive at Kew. The intensity of the sounds and light change constantly, echoing that of the real bee hive. The multi-winning Hive was inspired by research into the health of honey bees. It is a visual symbol of the pollinators’ role in feeding the planet and the challenges facing bees today. Two members had a ride around the garden on the Kew Explorer as it would not have been possible to see all the grounds on foot - they are so extensive. It was an excellent introduction to the gardens. In the meantime, four of us enjoyed walking along the herbaceous borders, known as The Great Broad Walk Borders and which opened in the spring 2016. The Great Broad Walk Borders form the longest double herbaceous border in the country. They stretch for 320 metres along either side of the Broad Walk path at Kew Gardens. The Broad Walk was originally designed to serve as an impressive formal promenade to the newly opened Palm House. 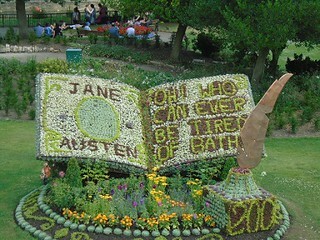 The gardeners planted 30,000 plants for a great diversity of texture and colour. The borders are at their best between June and September, and there are bulbs for spring and some late flowers and seed heads for autumn interest. 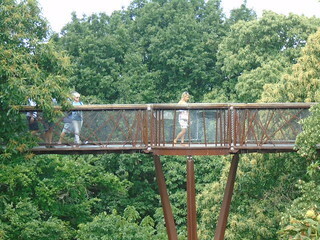 We then went on to the Tree Top walk. None of us had ever been into The Marianne North Gallery and The Shirley Sherwood Gallery of Botanical Art and we were not disappointed. We were particularly impressed by the former: Marianne North was a remarkable and talented Victorian artist with a great eye for botanical detail. In this extraordinary gallery, you can see 833 of her paintings displayed in geographical order, which she hung herself after travelling around the world. We agreed that we would like to go back to Kew Gardens to continue our explorations of its treasures, especially when the renovation of the Temperate House and of the Pagoda is complete. Our next visit will be on Tuesday 18th July when we will be visiting two gardens in Pantersbridge near Mount, courtesy of one of our members. Nine members of our group and one guest set off from Lostwithiel at 9.00am relieved that the weather had turned much cooler. It was most people’s first visit to Rosemoor and we were not disappointed. There was so much to see and admire and we spilt up in order to visit the areas in which we were more interested and equally importantly to do the visit at our own pace. 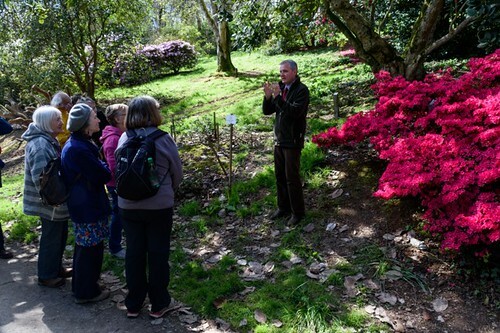 We also got together for a one and a half hour guided tour, led by a very knowledgeable and enthusiastic volunteer, the longest serving RHS volunteer at Rosemoor. We learned about the history of Rosemoor and Dianne pointed out the most significant places and plants in the garden. Rosemoor became home to Lady Anne Palmer and her mother following the death of her father, Robert Horace Walpole, the fifth and last Earl of Orford, in 1931. The Stone Garden, designed by Lady Anne’s mother, was the first area of hard landscaping. During the war the house was used by the Red Cross as a temporary refuge from the bombing for people from London’s Docklands and East End. After the Second World War, Lady Anne returned to live permanently at Rosemoor with her husband Eric Palmer and young son. 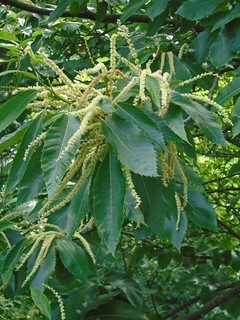 Lady Anne’s interest in gardening began in 1959, when she caught measles from her children and, while recuperating in Spain, met the noted plantsman Collingwood ‘Cherry’ Ingram. He opened her eyes to the beauty of the Spanish maquis and this became the first of many expeditions around Spain and England to see plants. Ingram also invited her to visit his garden in Kent and to take some cuttings and young plants back with her to start a garden of her own. She did just that and so started the plantsman’s paradise we know today at Rosemoor. 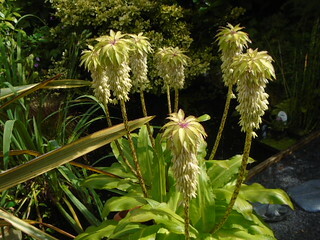 Lady Anne travelled widely to form her collection, including South America, Papua New Guinea, New Zealand, the USA and Japan, and such wide travels have led to great diversity among the 4,000 plants represented in Lady Anne’s Garden. When Lady Anne gave Rosemoor to the RHS in 1988, it consisted of the house, the 8 acre garden around the house and 32 acres of pastureland. In 1989 work began on building the new visitor centre, named the Robin Herbert Visitor Centre for the Society’s President at the time. This modern building, with its panoramic views across the garden, incorporates a shop, plant sales area, restaurant and lecture theatre. A new entrance road, car park and maintenance tracks were also needed, as well as drainage and water-supply systems, electricity, gas, telephones and sewerage. The small seasonal stream was diverted and dammed to form a series of pools and falls, with massed streamside plantings leading to a lake, which doubled as a reservoir containing all the irrigation water for the garden. With an underpass to link the new and the old gardens completed and the reservoir filled, the garden opened to visitors on 1 June 1990. The pattern of the formal garden was outlined by more than 1,200 hedging yews, and 2,000 roses formed the first ornamental plantings. Bisected by the A3124 the garden remains two very distinct areas. On one side is the original garden - Lady Anne’s garden - which remains a diverse collection of plants in an informal setting, and on the other is the new garden, a formal, decorative area in a glorious woodland setting - truly an astonishing achievement in such a relatively brief time. Many of the areas of the garden were at their best: the Herb Garden, the Potager, the Cottage Garden, the Lake, the Meadows, the Rose Beds (Rosemoor organises a Summer Rose Trail, one of a series of seasonal walks) as well as the Fruit and Vegetable Garden. However, this is a garden for all seasons and we all agreed that following this first visit, we would all want to go back as we felt that there was so much more we wanted to see. Rosemoor hosts the national collection of cornus trees and they were in full bloom. Some of us were also excited to see for the first time a tulip tree. We hope that the photos in this report will whet your appetite and we recommend this garden wholeheartedly to all our members. We will be visiting 2 gardens in St Neot, courtesy of one of our members, Judy Bowen-Jones and an e-mail will soon be sent to members. 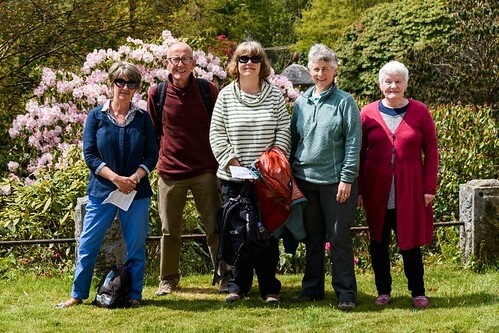 Fourteen members of the Gardens Visits Group journeyed over the border into Devon to visit this hidden gem of a garden on a lovely sunny morning. ‘Hidden’ it was, as one of our drivers found out when, with sparse directions and the non tech version of SAT NAV , the only option was to stop and ask! Something which is becoming a dying art these days. Well done Carol – for passing the test!! We all met up at the car park and made our way through to the gardens to wander as we wished and to meet up again around 1pm for lunch in the Old Billiard Room tea shop. Lukesland has a total of 24 acres, lying in the valley of the Addicombe Brook and was a joy to explore its many nooks and crannies amongst the woods, valley and streams. There were some magnificent rhododendrons looking at their very best in the sun, together with azaleas, bluebells, magnolias and many more flowering shrubs. Also there were plenty of places to sit and admire the streams and ponds created from the waters that flow down off Dartmoor. This is a very special and unique feature of this garden. They also have a variety of specimen trees including the Handkerchief Tree which promises to be in flower by the end of the month in all its glory. We were told that there were views over Dartmoor from the higher woods, but sadly we never found them. The House is only open to the public a couple of times a year and is still lived in by the third generation of the Howell family who also oversee the care of the gardens. Some of the group took a packed lunch and sat by the swimming pool (not a very inviting shade of green and in need of some TLC), before more walks along the little streams and over the little bridges that criss-cross the valley stream. The photography members in the group spent the day, some of it on their knees, trying for reflections, waterfalls, streams etc. and just capturing the beautiful surroundings. We hope that you enjoy the photos (including theirs) included in this report. The catering was limited, and for an ‘out of the way garden’, the Old Billiard room tea shop was surprisingly busy serving up soup lunches. Hopefully everyone managed to get something to keep them going. On such a lovely day it was a pleasure to be there and everyone enjoyed the visit. The gardens are open Sundays, Wednesdays and Bank Holidays until 4th June and then open again in October and November. We highly recommend this garden that none of us had heard of until a friend of Annie’s recommended that we should visit. A big THANK YOU to Jennie Mursell for organising this most enjoyable visit. More photos from our visit can be seen on flickr. 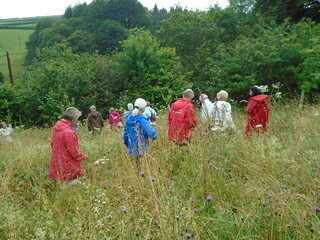 Our next trip is on Thursday 22nd June when we will be visiting RHS Rosemoor. Members will soon be e-mailed all necessary details. 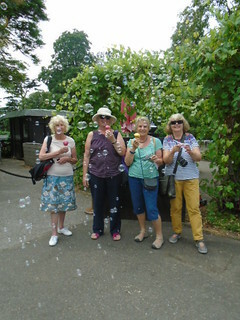 A big THANK you goes to Carol Williams for organising a very enjoyable day out. First, twenty one members and their guests made their way to the Polgooth Inn for a light lunch. Thirteen people travelled on the Lerryn Area Minibus driven by Annie. We got to Caerhays for 1.45pm and Annie gave us a thrill when she drove the minibus, without a scratch, under the arched gateway…We all laughed when we realised that fifty yards on, there was a proper drive into the estate, which Annie decided to use when we left the gardens as she thought that we had had enough excitement for one day! On arrival at the gardens we met up with three other U3A members who are in also in the photography group and who had spent some time in the morning taking photos. Caerhays is a spectacular spring garden and public opening is normally from February to the beginning of June. The 120 acre woodland gardens are Registered as a Grade II* Park and Garden by English Heritage and they are home to a National Magnolia Collection (600 SPECIMENS). The origins of this historically important collection of Chinese plants can be traced back to the work of the great plant hunters Ernest Wilson (1876 - 1930) and George Forrest (1873 - 1932). The gardens at Caerhays are a fantastic spring-time wonderland for visitors. Although there are structured walks around the garden giving views over the estate and grounds, the lake, and out to sea, Caerhays is not a manicured or planned garden in the conventional sense. 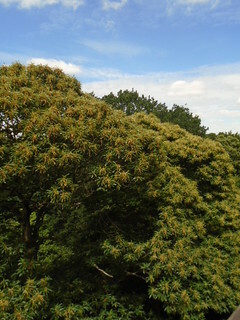 It is however designated as being of outstanding importance by Kew Gardens. 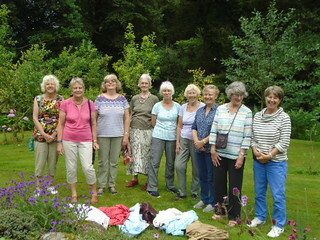 We had pre-booked a guided tour of the gardens by the head gardener, Jaimie Parsons, which lasted last around 1½ hour. It was a very nice day out and it was good to have such an expert guide. We were amazed to learn that only four gardeners look after the gardens. There was originally no sea view from the house. It was created by the miners who were employed to remove the banks that were blocking the view..
Evergreen azaleas are no longer classified as azaleas but as rhododendrons. If you are a magnolia, rhododendron or camelia that does not grow, beware as Jamie will not hesitate to use his chainsaw! A magnificent range of magnolias and rhododendrons, some 120 years old whilst others had been planted in the last few years. I was surprised to find a range of perfumed varieties. We were given the stripped bark of a magnolia to smell. The scent was very lemony and Jaimie explained that Caerhays sells bags of the bark for £900 each and the bark is used by Molton Brown to make their products. No wonder the lotions are so expensive! There is a variety of rhododendron which is pollinated at night by beetles. We were advised not to smell the flowers! My sort of garden: let it grow but look after it! Our next visit is scheduled for Wednesday 10th May when we will visit Lukesland near Ivybridge in Devon and members have already been e-mailed details.